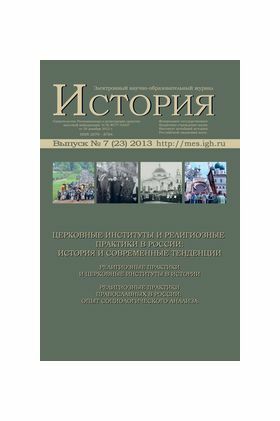 The present edition of the Digital scientific-educational journal «History» is prepared by the Centre of Religion and Church History of the Institute of World History of the Russian Academy of Science. In its preparation both historians and social scientists engaged in the study of contemporary religious situation in Russia participated. The first part of the issue includes articles devoted to the study of religious institutions and religious practices, as well as the everyday life of the Orthodox and Protestants in Russia at the end of the Empire and during the Soviet times. The second part consists of previously unpublished materials of sociological survey of the 2009 «Religious practice of the Orthodox believers in Russia», completed by the «Levada-Center» on the request of German charitable Catholic organization «Renovabis», as well as articles dedicated to the analysis of the religious practices in modern Russia. Religious practices in the USSR: the processions with miracle-working icons and the public prayers in 1920—1940-s.
Veneration of the Virgin’s Sculpture from Kostishy in the 1950—1980’s.